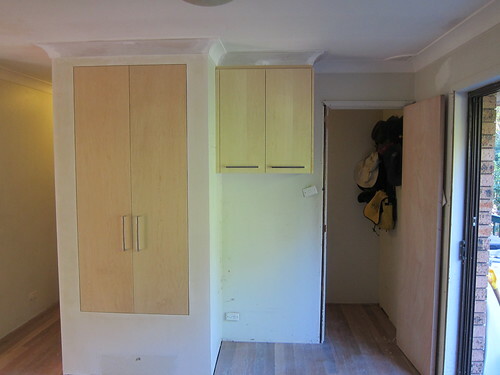 We left the house at the end of the post before last with the kitchen sitting unassembled in the lounge room and us living in half the rumpus room downstairs. We’re still living the rumpus room but a few things have happened elsewhere. 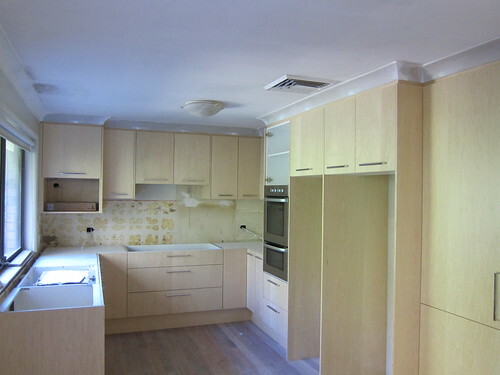 My renovations, let me show you them. 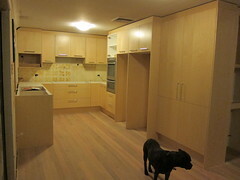 So that’s the kitchen, looking very kitchen-y but still with no benchtop, splashback or connected appliances. 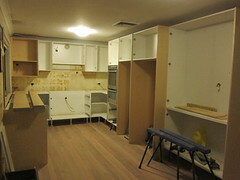 And we need to paint. 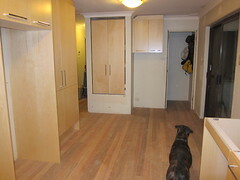 And put in new skirting boards. 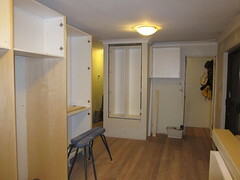 And architraves around the windows and doors. 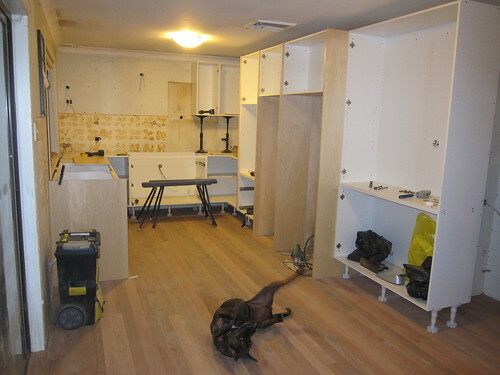 And get the floor sanded and finished. Um. Yeah. 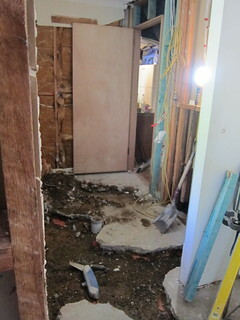 Work on the downstairs bathroom/laundry is now well underway. All the plumbing and the windows are being moved around for this, so it’s going to take a while, probably about 4 weeks in the end. A. 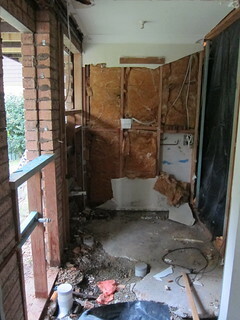 The laundry/bathroom area with dividing wall and doorway removed. B. 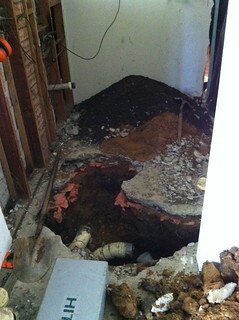 There was a little bit of plumbing work needed. That hole in the concrete slab? Jackhammer. Fun times. A. 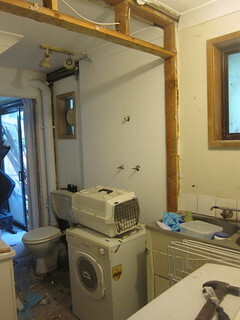 New plumbing done, notable lack of wall and window. B. 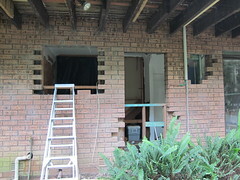 New window, new bricks and the electrician has been too. The brickie was supposed to come on the Friday. Or the Saturday morning. Or Monday. 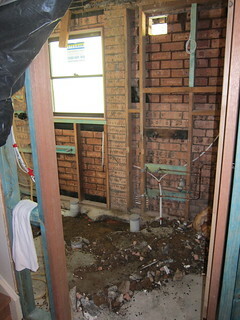 The brickie was busy, and then he was sick. 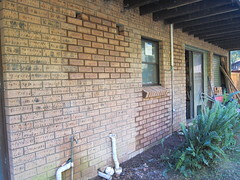 The brickie’s son came this morning and did a fabulous job. We stuck our heads firmly in the sand for all the days and nights we spent with gaping holes in the back of the house and pretended that no-one ever gets burgled in our neighbourhood. A. 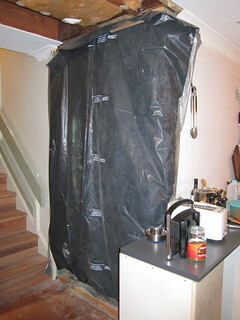 Keeps dust out, probably would not have been so effective against burglars. B. 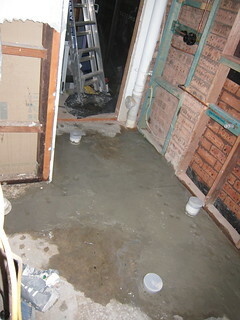 Just about ready to have the slab reinstated. 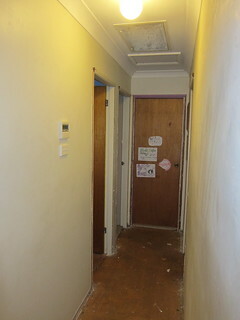 Also, new door. Whatever I might have thought about the holes in the back of the house, the animals thought it was great, so much so that they are very put out to discover tonight that the convenient egress is no longer there. The new door kept the dog from making her mark in the newly poured concrete, but we weren’t quick enough to stop the cats from slipping through the hole in the wall beside the door. 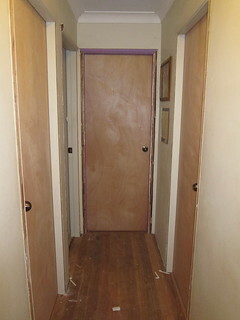 Speaking of new doors, we have them going in all over the house. In fact there’s only one door we’re not replacing. That’s the one into the garage downstairs. 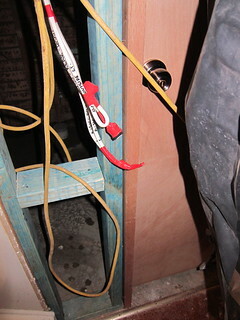 It’s also the one Adam managed to break the lock on yesterday when he was moving the wine racks out of the way, and tonight it got stuck closed and we had to dismantle and remove the door handle in order to open it. 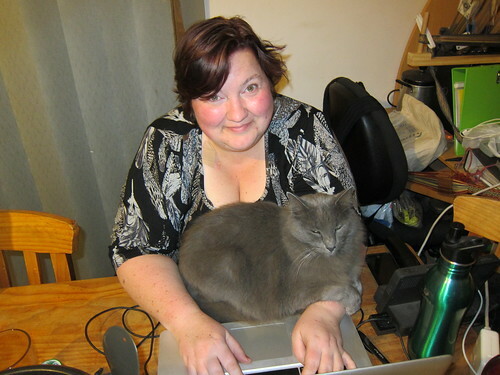 Tonight’s blog brought to you by a grey, furry wrist-warmer who is still trying to figure out how to sit on me when I’m on a kitchen chair instead of a lounge. Oh wow. You deserve a medal for living there through all this! And I love that pic! I love the idea of the cats paw prints being hidden under the tiles, perhaps to be found by owners in the future, or maybe even archaeologists.